A LEAN, SINEWY WOMAN with dark tragic eyebrows, a spray of hennaed hair and a Scottish thistle tattooed on her shoulder stands in the midst of Grand Central Station, improvising on a snare drum. The passers-by stop to watch, and the walls and the ceiling of the train station echo back the sound. But the musician doesn't hear it in the conventional sense. Evelyn Glennie, 80 percent deaf since adolescence, is a renowned solo percussionist. As profiled by Thomas Riedelsheimer in Touch the Sound, there's less of a sense of her life as a narrative and more of her aura as a person. Born on a farm, she overcame her handicap to become an internationally sought-after musician (she was a soloist with Philip Glass, for instance). Her success can be guessed at by seeing her working on her website (www.evelyn.co.uk) as well as a home office with three clocks for telling international time. Glennie's hearing isn't the most important thing about her. As she writes on her website, "Deafness does not mean that you can't hear, only that there is something wrong with the ears. Even someone who is totally deaf can still hear/feel sounds." The documentary raises the question of how we sense sounds, through the portals of our ears, or with our skins? Touch the Sound demonstrates a heightened sensitivity to surroundings. It's a technique that will be familiar to those who adored Rivers and Tides, Riedelsheimer's documentary about Andy Goldsworthy, the artist of earth, ice and stone. Riedelsheimer follows Glennie on her travelsincluding a stint in Santa Cruzand observes performances along the way. Glennie plays in a seaside castle in Aberdeenshire, where she uses walkie-talkie feedback like a hand-held theremin. It's as if she is answering the cries of seabirds. 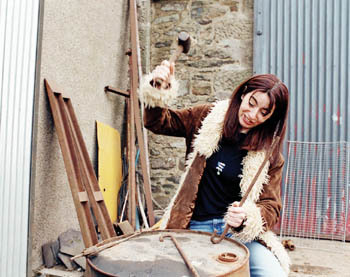 She and collaborator Fred Frith improvise a CD in the bowels of a half-torn-down factory in Cologne. Frith drags a violin bow against the grates and railings on the walls, starting a drone that's an overture to a jam session in which the flutter of a pigeon's wing is the last trailing note. Glennie is the opposite of Goldsworthy in some ways. He is solitary and cryptic; she is gregarious and open to the camera. So the question is, Why isn't this film as compelling as its predecessor? It may be that the very nature of Glennie's art mutes the tension. A film of a drum solo takes an experience that is already not for everyone and removes it a step from immediacy. Yet Glennie urges viewers to open their senses to the sounds around them. Since my technophobia flares up at the sight of iPodswhat are we trying to drown out with all those hundreds of hours of music?I'd repeat Glennie's approach to soundscapes: "I want to be open to absolutely everything that comes my way." Touch the Sound (Unrated; 113 min. ), a film by Thomas Riedelsheimer, opens Friday at selected theaters.